Are you good at what you do? Of course you are, but that’s not enough to be successful. You need to think deeply about your brand, how you show up in the world. Everything you do, from the way you answer the phone to how you dress for meetings and handle complaints, should reflect you and your business. It sounds obvious, but all too often business people, especially those of us running small businesses, forget the branding mantra. 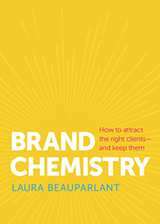 Laura Beauparlant, a branding expert and author of a new book, Brand Chemistry, tells us what the five top mistakes are, and how to fix them. You’re generic, unremarkable, just like everyone else in your category. You’re presenting an image that’s unsuitable for your target market, so you get the clients you don’t want. You have no formalized system to establish trust. You lack consistency. For example, the colors you choose differ from one platform to the next. Be memorable. You should be the only choice for the clients you want to have. Make sure that your brand is aligned with the message you want to convey to your target market. Create formalized systems to make sure your customer experience reflects your brand. Be consistent. Establish brand guidelines to be used every time your logo shows up. Be true to yourself, especially when you consider the experience customers have in dealing with you and your company.